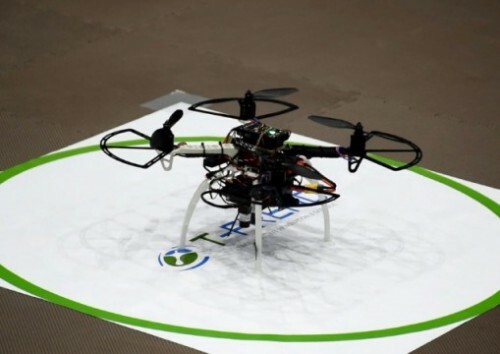 TOKYO - A drone that hovers over Japanese employees and blares music to force them to go home was unveiled on Thursday (Dec 7), as the country tries to reduce its notoriously long work hours. The "T-Frend" buzzes over those trying to work late, blasting out the strains of Auld Lang Syne, a Scottish tune typically used in Japan to announce that a store is closing. "You can't really work when you think 'it's coming over any time now' and hear Auld Lang Syne along with the buzz," said Norihiro Kato, a director at Taisei, an office security and cleaning firm that co-developed the system. The machine recognises its location on a building floor without GPS. It takes off from its port, makes a surveillance flight on a pre-set path and then returns autonomously. The fee for the service is yet to be officially set but "the target price" is around 500,000 yen (S$6,000) a month, said Kato. T-Frend, therefore, serves the twin function of reducing overtime and making up for this labour shortage, the firms claimed.